Davante Adams: What’s His Ceiling With Jordy Nelson Gone? With the NFL Draft and free agency having come and gone, we’ll break down all sorts of fantasy-relevant questions entering the 2018 season. Up next is a look at a perennially underrated Green Bay Packers wide receiver who will enter the season as Aaron Rodgers’ unquestioned No. 1 option. The Packers offense fell apart after Aaron Rodgers broke his collarbone in Week 6 of 2017. Whereas they averaged 24.4 points per game with Rodgers under center, they managed just 16.6 in nine starts with Brett Hundley. 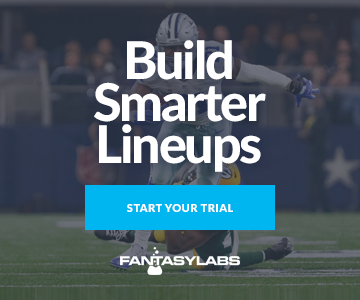 Longtime offensive stalwarts Jordy Nelson and Randall Cobb averaged 10.8 and 3.4 fewer DraftKings points per game, respectively, with Hundley under center in 2017. And then there was Davante Adams, who converted a career-high 8.4 targets per game into a season-long 74-885-10 line despite working mostly with a quarterback in Hundley that ranked outside of league’s top 30 signal callers in adjusted yards per attempt (4.7), air yards per attempt (2.5), and completion percentage in every type of situation, per Player Profiler. By all accounts, Adams was a top-10 receiver despite mostly working with a bottom-10 quarterback. The return of Rodgers — coupled with some key depth-chart subtractions — could mean the best is still to come for the Packers’ 25-year-old top wideout. Including the playoffs, Rodgers and Adams have connected for 20 touchdowns in their 26 games together in 2016-2017. No other receiver in the league has managed to match Adams’ regular-season touchdown mark during that span. Question: Who has scored the most receiving TDs over the past two seasons? Adams has maintained a spectacularly fantasy-friendly target workload; he and new-teammate Jimmy Graham have each seen a league-high 46 targets inside the red zone since 2016. Adams’ ex-teammate Nelson is third on the list with 44 such targets, so there figures to continue to be plenty of opportunities in scoring position to go around. There’s no doubting that Adams is a talented receiver. Still, plenty of talented receivers don’t manage to score 20 times in their career, let alone in two seasons. Rodgers managed to feed Nelson’s corpse a league-high six touchdowns in 2017 before his injury, demonstrating his never-ending ability to get the most out of his receivers, which is good news for Adams going forward. Rodgers has finished as a top-two fantasy quarterback in seven of his eight seasons with at least 15 starts. The NFL’s all-time leader in adjusted yards per pass attempt “struggled” only in 2015, finishing as “only” the fantasy QB7. Perhaps it wasn’t a coincidence Rodgers had his worst professional season in a year when Nelson played zero games due to a torn ACL, but that didn’t stop him from getting his teammates into the end zone. The top receiver in the Packers offense has averaged 10.9 touchdowns per season during the Rodgers era, while the No. 2 option has averaged 7.4. Rodgers essentially provides enough touchdowns to sustain two, sometimes three, top-tier fantasy receivers. Adams is currently the WR7 in PPR average draft position on Fantasy Football Calculator at the time of this writing. Rodgers’ No. 1 receiver has routinely offered top-tier touchdown upside, and Adams was already the team’s featured red-zone weapon before Nelson left. Freshly strapped with the league’s seventh-highest average contract among all wide receivers, Adams couples a top-five ceiling with a top-10 floor. 3 Fantasy-Friendly Quarterback Archetypes Using NFL Combine Metrics to Find Running Back Value Using Quarterback and Offensive Line Ability to Find Running Back Value Julian Edelman: Who Benefits From His Expected Four-Game Suspension?